This screen is accessed from the back-end Joomla! administrator panel. It is used to edit template master files and associated stylesheets. 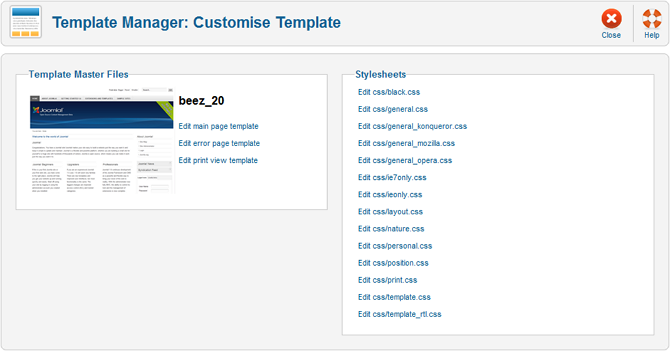 Navigate to the Template Manager: Templates screen. To edit a template, click on the templates's name. This is where you edit a template's source code. You can edit the template's master files and stylesheets from this screen. Edit main page template. The primary file used for the template's layout. Edit error page template. The template layout for the site's error pages. Edit print view template. The template layout for the site's print view function. This section contains all of the template's editable stylesheets. Click on a stylesheet's name to edit its source code.